Israel and Paula are teens living in Biala Podlaska, Poland, on the eve of World War II. One day Israel tells Paula that he will marry her in a few years. She objects, and their friendship ends. But when the Germans enter the city, they flee together to Russia and volunteer in Soviet labor camps – to survive. They are sent to different places. Paula works as a nurse, where she excels and is sent to Moscow to study medicine. There she marries Mila and has a son, but Mila dies at war soon after. At war’s end, in love from afar, will they ever succeed in reuniting? Meanwhile, Israel returns to his hometown as a Polish soldier and finds a letter from Paula. Their love is rekindled from afar, and he proposes marriage by mail. But will Israel ever be able to manipulate the Russian authorities to obtain a visa to penetrate the Iron Curtain and then reunite with Paula in Moscow? Will their love ever again be free to flourish? 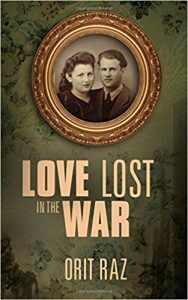 Love Lost in the War is the tragic story of Israel and Paula. As teenagers in Poland, Israel falls in love with Paula. Yet when Israel proposes marriage, Paula is reluctant to wait a few years to get married, and this abruptly stops their friendship. But when the Germans occupy the city, Israel and Paula escape together. Still, the war tears them apart again. Paula gets married and has a son, but her husband Mila dies during the war. Israel, in the meantime, has returned to Poland, where he finds a letter from Paula and starts having feelings for her again… But can their love survive war? This is an inspiring story about how long can transcend even the worst circumstances, such as war. For me, the story was quite personal as my own grandmother and grandfather got seperated during the war – my grandfather took his brother’s place to go to one of the labor camps when his brother got arrested for smuggling. My grandmother was about to marry someone else when my grandfather showed up back in town, several years after World War II (yes, this is the kind of stuff you only see in movies). Everyone was convinced my grandfather had passed away in the war but in reality, it just took him several years to get back home after having been freed by American soldiers. Anyway, back to the book. It reminded me a lot about my personal story and maybe that’s part of why I liked it so much, but another part of it was the lyrical prose. I’m a huge fan of Raz’ writing here and the prose is perfect for a love story such as this one.